In some respects, a carnival is a carnival – the same sort of event, up to a point, wherever in the world it might be occurring. That’s part of a carnival’s universal appeal. 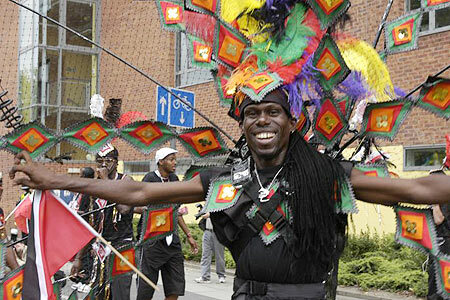 But within the broad similarities of atmosphere, there’s room for a lot of variation, as a chat with Liverpool International Carnival’s artistic director Ray Allan Mahabir reveals. ‘What we’re essentially doing this year,’ he explains, ‘is showcasing a costume project that’s come together over the three previous carnivals. It’s my sixth year with the carnival and this is the largest piece of work we’ve done so far. ‘It will combine elements of African tradition, Latin-American and samba styles, with the usual live drumming and music, floats, dance companies and 25 large-scale costumes all parading. Each group featuring in the carnival has taken charge of a different costume section. We’ve collaborated with local, regional, national and international artists to create much of it but we’ve also worked with schools, community groups and event organisers in Liverpool. In 2005, Mahabir and his colleagues looked for inspiration in the iconic aesthetics of the fleet of ships passing in and out of Liverpool during the slavery boom period. In 2006, they decided to model their endeavours on African cultures of the slavery and pre-slavery era. Last year, of course, they focused on celebrating the 200-year anniversary of the abolition of slavery.